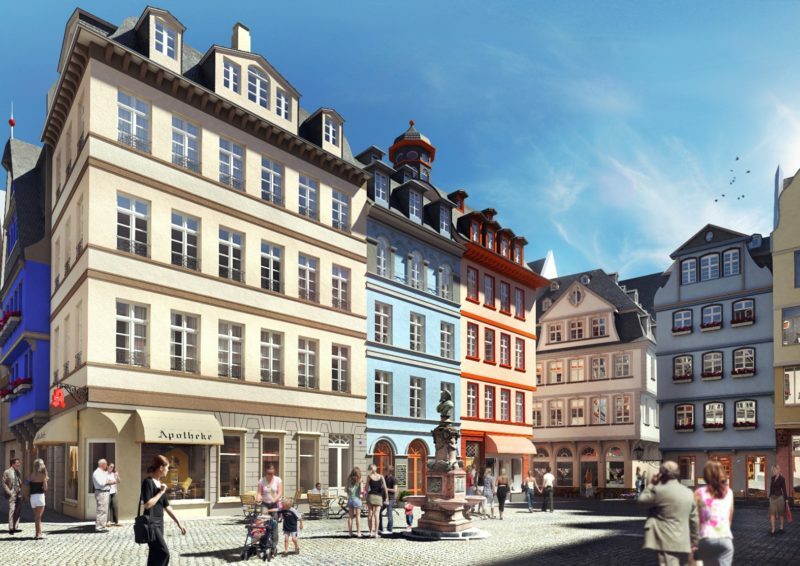 Frankfurt is reclaiming an integral part of its rich and colourful history: After years of construction, the new old town between Römer City Hall and Emperors’ Cathedral is completed. October 12, 2018 – Frankfurt’s reconstructed old town is a popular destination for locals and visitors alike. Here, they’ll have the chance to enjoy a coffee, a museum visit or a shopping spree, all the while basking in the aura of a time-honoured old town nestled in the heart of an international metropolis. The harmonious architectural blend of the new quarter calls to mind the moving history of Frankfurt. The old town’s archaeological gardens feature the remnants of a former Roman settlement and an imperial palace dating back to Carolingian times, explained by way of a special video animation. Last but not least, there’s the so-called Coronation Route, which follows the footsteps of former kings and emperors to the place of their crowning. In bygone times, Frankfurt’s old town was at the centre of the social, economic and political goings-on in both the city and the empire. Markets and international trade fairs were held here, kings were elected and emperors crowned. Situated on the ground floor of the Römer, Frankfurt’s hall, the so-called Römerhallen (“Roman halls”) once served as a famous mediaeval marketplace. During trade fairs, booth space was hired out at extraordinary prices. The Römer continued to be used for these mercantile activities until 1846, at which time the fair business in the city centre came to an end. Upstairs in the “Ratsstube”, the electoral chamber of the Römer, emperors of the Holy Roman Empire were appointed by the electoral princes of Germany. Once elected, the new sovereigns of the empire were crowned with great fanfare at Frankfurt Cathedral. At the conclusion of the coronation ceremonies, the procession of dignitaries traditionally made their way back to the Römer by way of the so-called Coronation Route, where the official celebrations then took place. Germany’s one-time largest mediaeval old town was also the home of many great poets, philosophers and composers, men like Johann Wolfgang von Goethe, Arthur Schopenhauer, Clemens Brentano, Ludwig Börne and Georg Philipp Telemann. Back in the day, the quarter’s hustle and bustle attracted countless visitors to the city centre, especially when trade fairs and large-scale events were taking place. With the reconstruction of the DomRömer Quarter, this cosmopolitan lifestyle is being brought back to Frankfurt’s old town. Some 15 historical townhouses have been rebuilt, while 20 new buildings have been erected in the typical style of Frankfurt’s old town. Spread out over 7,000 square metres, the “new old town” features quaint laneways and plazas, approximately 80 apartments and some 30 shops and restaurants. The project breathes new life into the old town, bringing people here to live and to work while combining the past and present in a harmonious blend. Two brand-new city tours have also been conceived, this tour includes, amongst other things, admission to the Historical Museum Frankfurt, a river cruise, hotel accommodation and the Frankfurt Card for use of the city’s public transport system. Come and discover the new DomRömer Quarter!